We've adopted a new charity! We are the Villagers! As a company, we have always been involved in collecting toys and money for the children of Midland, however, when our son Matthew was 4 he decided he wanted to help us with a very worthywhile cause. It's been over 11 years and he is still very happy making these beautiful creations and especially about helping other kids. 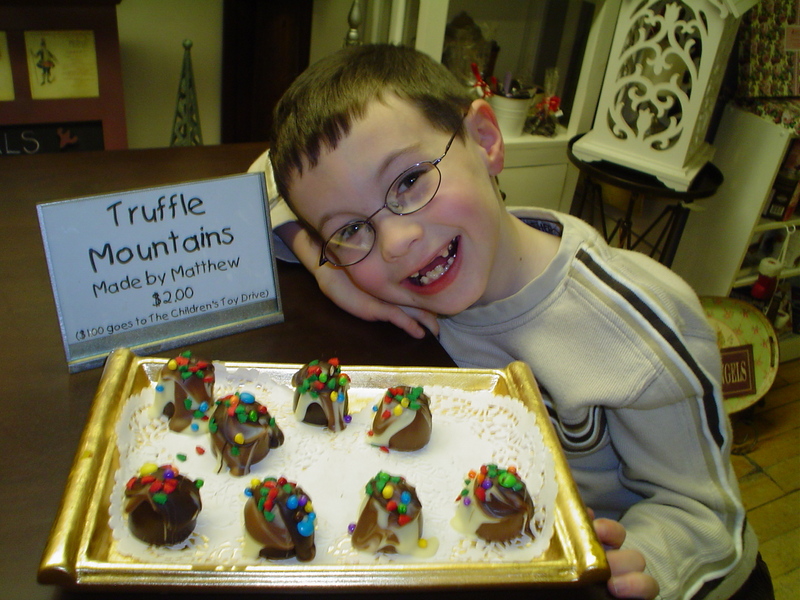 He decorates a Belgian Truffle and sells them for $2.50 each. Matthews earns $1.00 and donates $1.50 to "The Village"
She started with the hopes of helping kids in Midland and is now represented in over 19 communities with over 800 kids being helped! We had hoped that this would teach Matthew the value of earning money, but it has gone far beyond that. He loves being able to help other children, whether it's extra curricular activities or making sure kids have a memorable Christmas. We accept donations of unwrapped toys any time of the year as well as cash for the Midland Children's Toy Drive.